This report is an executive summary of research which explores the barriers unmarried fathers experience to shared parenting. 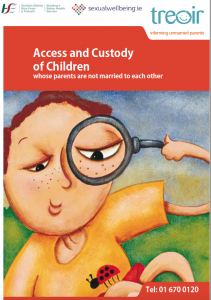 This leaflet explains what access and custody rights mean and describes how to get these rights through agreement, with the help of a third party or through the courts. Click to download. It is an offence for a parent or guardian to take or send a child under 16 years out of the State in defiance of a court order or without the consent of the other parent, if that parent is a guardian. Click here to download. Is a booklet especially for grandparents of children whose parents are not married to each other. We outline possible solutions to various difficulties that may arise, e.g. lost contact with their grandchildren. (22 pages). Recent legislation, 18/1/2016, changes sections of this publication. This booklet explains the rights and obligations of cohabitants contained in the Civil Partnership and Certain Rights and Obligations of Cohabitants Act 2010. We outline the current legislation as it applies to cohabitants. This leaflet explains how paternity can be presumed or established and also how it can be declared by the court. We also describe the DNA testing procedure. See the Establishing Paternity section of our website for a limited list of accredited testing services. Is for parents who are not living together. We offer suggestions on how to talk to your child about her/his family situation. This leaflet explains what guardianship means, who can become a guardian and how an unmarried father can get his joint guardianship rights. We also show how important it is to make a will. This is the official form that both parents must sign if they agree to the father becoming a joint guardian. Is a publication for those supporting students who are pregnant and who are parents in our education system. Gives information on a variety of issues such as guardianship, access and custody of children, maintenance, birth registration, passports and more, in several languages. Since this information was published in 2006 new legislations has been introduced particularly in relation to guardianship matters. Up-to-date information can be found in the information section of this website, but unfortunately the information is currently only available in English. A Video describing the situation of non-Irish parents of children born in Ireland who are Irish citizen children. This leaflet explains how to arrange maintenance payments through agreement between the parents, with the help of a third party or through the courts. Expenses sheet – Will help you work out how much it costs to raise your child and therefore come up with a fair and reasonable amount of maintenance. This information leaflet explains who needs to sign Passport Application Forms where parents are not married to each other. Explains how to register the birth, choosing a surname for your child and why it is important to have the names of both parents on a child’s birth cert. The Growing Up in Ireland Study (GUI) was initiated as a part of the national longitudinal study of children in Ireland. 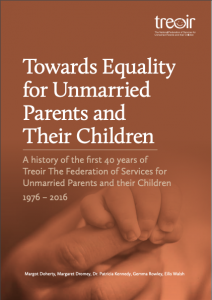 This report provides an analysis of data contained in the GUI study and provides baseline data on unmarried parents, living together or apart and some outcomes for their children. The report was undertaken by Dr. Owen Corrigan, Trinity College, and commissioned by Treoir thanks to funding received from the HSE Crisis Pregnancy Programme. Keyfindings. Outlines why it is important for children to have both parents in their lives. We talk about the advantages of shared parenting and we offer suggestions that might make shared parenting easier. IMPORTANT! – PLEASE NOTE: Following the commencement of legislation (18/1/2016) contained in the Children and Family Relationships Act 2015 there are many changes to the law in relation to Access, Custody, Maintenance and in particular Guardianship. See www.treoir.ie for up-to-date information. This leaflet describes the nature of our services. It provides: a list of our publications, information on outreach sessions, contact details for The Teen Parents Support Programme (TPSP) etc. This information leaflet summarises how a father can get legal rights (joint guardianship) to his child, the legal implications if the mother marries either the father or another man and the issues if his child is being placed for adoption. A significant research study by Dr. Owen Corrigan, commissioned by TREOIR and funded by the HSE Crisis Pregnancy Programme has been launched. The report gives us a greater understanding of the lives of children in different family types. The research was undertaken using the Growing Up in Ireland study data, a major longitudinal study of children which commenced in 2006, and collected information on 11,134 children and their parents in Ireland when the children were nine months and three years. Key Findings 1 : Marital Status, Family Transitions and Solo Parents, including non resident fathers.